King Benjamin uses chiasmus several times in his great speech in Mosiah 2–5. 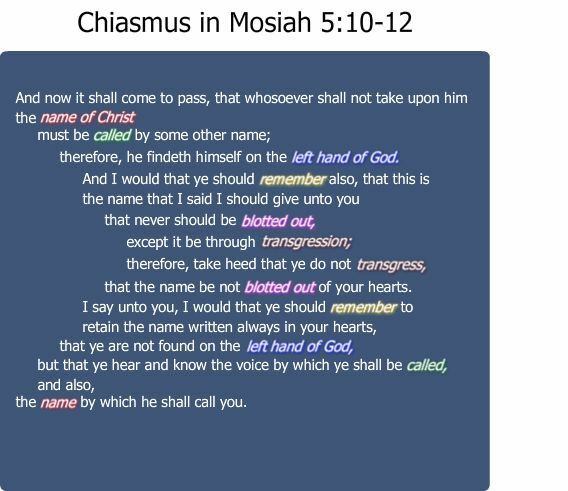 In Mosiah 5:10–12 he emphasizes the central importance of taking upon oneself the name of Christ. In this concluding section of his speech, the people enter into a covenant with God and are called the children of Christ. They receive the name of Christ, which will never be blotted out, except by transgression. Transgression therefore receives the focus as the center of this chiasm, which stands at the center of this final section of the entire speech. Benjamin's skillful use of this literary form shows that he carefully and deliberately prepared his masterful oration.